One of the most popular tourist attractions in the Charlottesville area is the house that Thomas Jefferson lived in, which he called Monticello. I had investigated visiting it before reaching Charlottesville and had to take it off the list again a there is no public transport to it from the city. Instead, I took a stroll around the weekly farmers’ market and bought a Christmas gift as well as lovely grapes to eat on the train the next day. Staff from Monticello had a stand in the market advertising their harvest festival activities. I decided to go up to them and tell them that they are loosing out on tourists by not having a service to and from the city. Just a daily bus that leaves say the Amtrak Station at 10 am and returns there at 4pm would be fine. Having made my views known, I was then offered a lift up to the house by one of the staff. If I came back at 11:30, he would drive me up there. So I did and he was true to his word and I DID manage to get to see Monticello. As a non-American I didn’t really know much about it, and it was only when the guide mentioned the ‘Nickel View’ after the tour of the house that I realised it is the house pictured on the 5c coin. 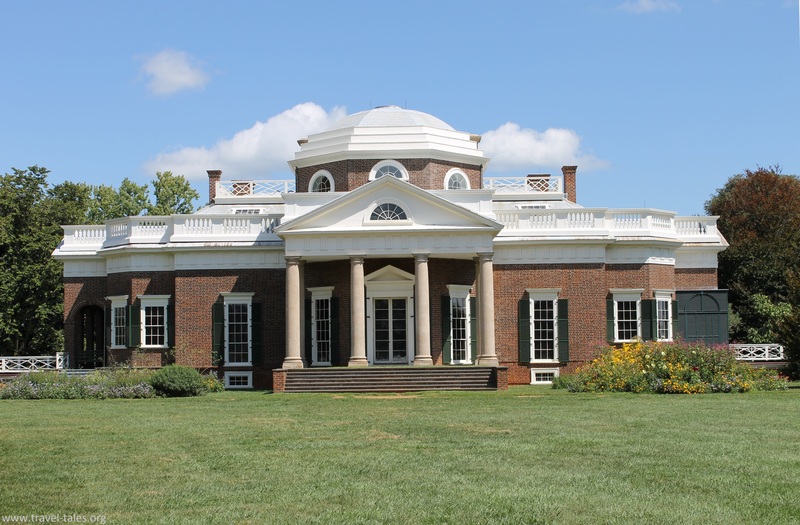 Jefferson was a keen botanist and collected plants from around the world on the grounds and slaves tended the vegetable garden which fed the household, as well as fish which were temporarily held in the pond. On the edge of the vegetable garden is a folly providing protection from wind and fabulous views over the countryside. There is a graveyard on the property, still used by the family where Thomas Jefferson is buried.